In the past, Disney has had one app for each of its TV networks - Disney Channel, Disney Junior, and Disney XD. That means three apps you have to manage, and (at least) three times you have to enter your cable credentials to get access to all available content. Now the company is consolidating all three into the new 'DisneyNOW' app. There isn't much in the way of functional improvements compared to the existing applications. It supports profiles, like Netflix/Hulu, and each profile can have tailored content/recommendations. Once you login with your cable subscription, you'll get access to a wide variety of shows and Disney Channel original movies. This includes Star Wars Rebels, Andi Mack, Disney Junior Nursery Rhymes, Mission Force One, and more. Disney will occasionally add temporary content, known as 'Collections.' The first will be Halloween-themed content from Gravity Falls, Phineas and Ferb, Mickey Mouse Clubhouse, and so on. All episodes of Wizards of Waverly Place, plus the TV movie, are also currently available to celebrate the show's 10th anniversary. You can download DisneyNOW from the Play Store below. It's also available on iOS, Amazon Fire tablets, Apple TV, and Roku. You can also download it from APKMirror. 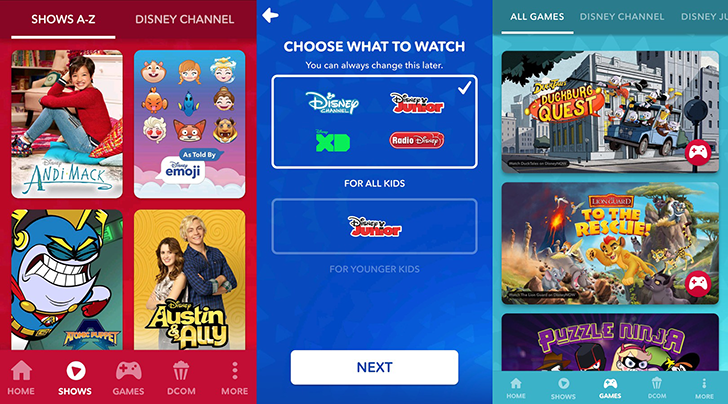 Three popular Disney Channel-branded WATCH apps for kids age 2-14 – downloaded more than 40 million times since 2012 – have been consolidated into one newly branded DisneyNOW app that upgrades the user experience with customizable and personalized functionality while continuing to provide an extensive array of series, television movies and other entertainment content from Disney Channel, Disney XD, Disney Junior and Radio Disney. 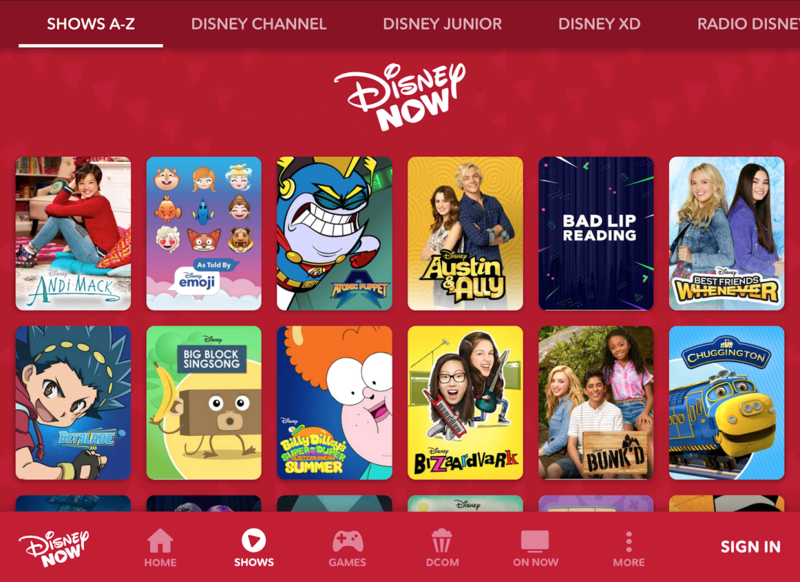 Like the WATCH streaming apps, access to full episodes and live streaming of Disney Channel, Disney Junior and Disney XD continues to be available when viewers authenticate via their participating cable, satellite or digital programming distributor. Each network also offers a selection of full episodes to fans without signing in. DisneyNOW is available today, THURSDAY, SEPTEMBER 28, on iOS, tvOS, Android/Kindle and Roku. Fire TV, Android TV and the Web will launch in 2018. Showcased last February during Disney Media Sales’ presentation to clients, the DisneyNOW app is designed to satisfy viewers’ demand for more content, easier access, more control, including Disney Junior Only Mode, and more “Disney magic,” including personalization that’s so crucial for kids – all in one app. Customized sponsorship opportunities offer clients a variety of ways, including sweepstakes and interactive video advertisements, to engage with consumers. Disney Channel launched its suite of Apps (branded WATCH) in 2012 and was the first entertainment network to launch products that provide pay TV subscribers access to live, linear network streams as well as on-demand episodes. DisneyNOW invites each family member to create a profile and express themselves with a Disney Emoji avatar – a selection of more than 180 heritage and new character poses at launch. On return visits, users can select their profile to resume watching where they left off or watch new episodes of their favorite shows. The new app will also include more than 60 games and activities including “DuckTales” adventure game “Duckburg Quest,” Princess Elena of Avalor in “Flight of the Jaquins” or the Villain Kids in the “Descendants 2 Wicked Style” activity. New games will be added to DisneyNOW every month. Disney Channels Worldwide is a global portfolio of 120 kid-driven, family-inclusive entertainment channels and/or channel feeds available in 162 countries/territories, in 34 languages. The platform brands are Disney Channel, Disney XD, Disney Junior, Disney Cinemagic, Disney Cinema, Hungama, Dlife and Radio Disney Networks. Disney Channel content is distributed through cable, satellite and digital terrestrial television channels, and via a strategic partnership with Disney Media Distribution to third-party broadcasters across the globe. In the U.S., fans can access full episodes on desktop, mobile and connected TV devices via Disney Channel, Disney XD and Disney Junior apps. Live, linear feeds and exclusive window programming are also available on these apps for viewers who sign in with a participating pay TV provider. Disney Channel properties continue to rapidly expand into new markets across the world, playing a key role in introducing the Disney brand to nearly 515 million viewers worldwide. *COPYRIGHT ©2017 Disney Enterprises, Inc. All photography is copyrighted material and is for editorial use only. Images are not to be archived, altered, duplicated, resold, retransmitted or used for any other purposes without written permission of Disney|ABC. Images are distributed to the press in order to publicize current programming. Any other usage must be licensed. Photos posted for Web use must be at the low resolution of 72dpi, no larger than 2×3 in size.